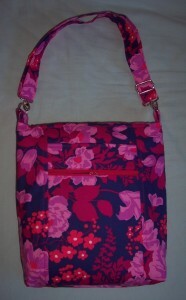 Bold Print Cross Body Bag number 10! This is a gift for my sister who celebrates her birthday in October. 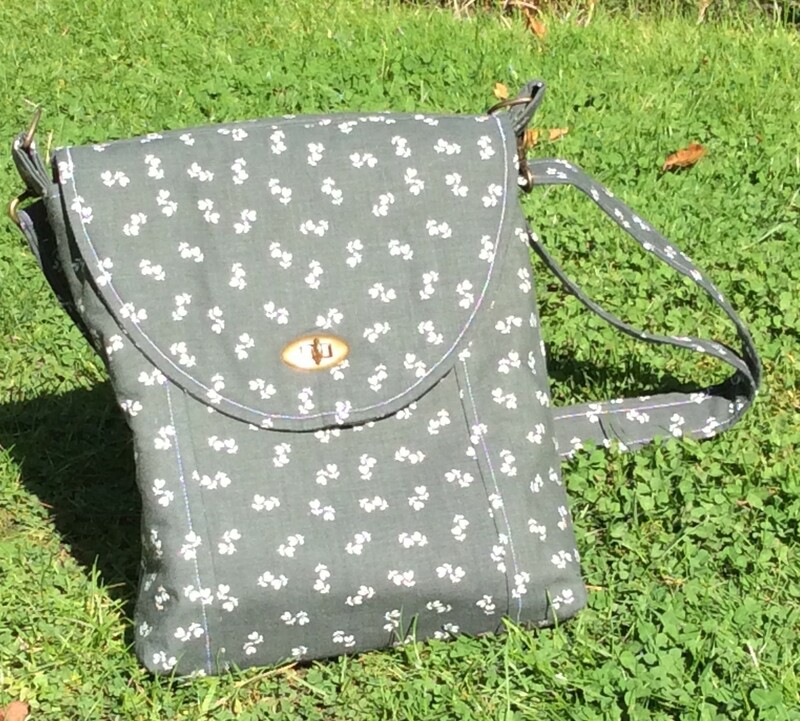 I just managed to get it completed together with a co-ordinating purse for inside and is now ready for packing and posting to North Wales. Catherine originally requested jewel colours and although this may not fit exactly her idea of jewel colours I feel sure that with the Navy background and bold, bright print of flowers this will be acceptable. 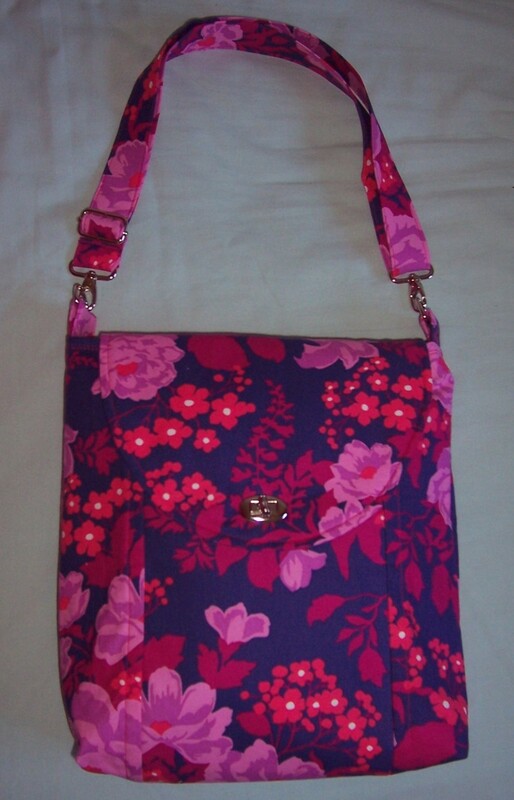 The lining is a deep Cerise Pink which I recycled from a skirt that I no longer wear. The hardware is nickel and I used my favourite twist lock closure. 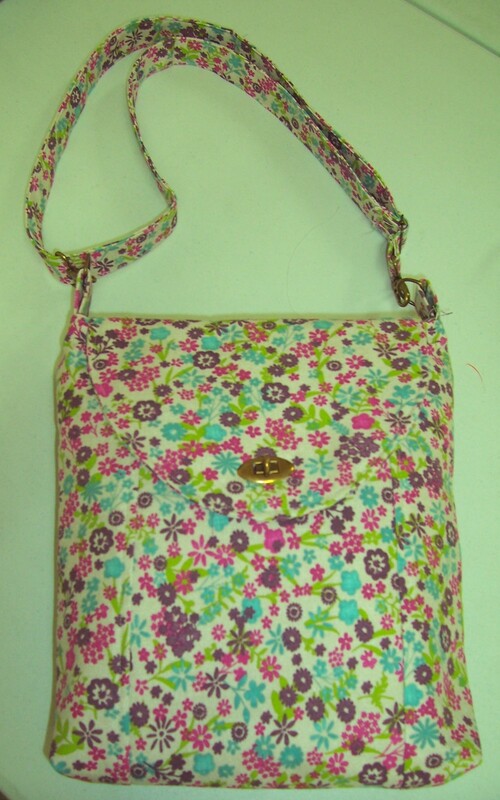 Infact, I am so pleased with the bag that I shall be buying another metre of the fabric to make a bag for myself which will co-ordinate with my Cerise Pink car coat. Today I spent a most enjoyable time at New Threads, Weyhill Fairground Craft Centre. 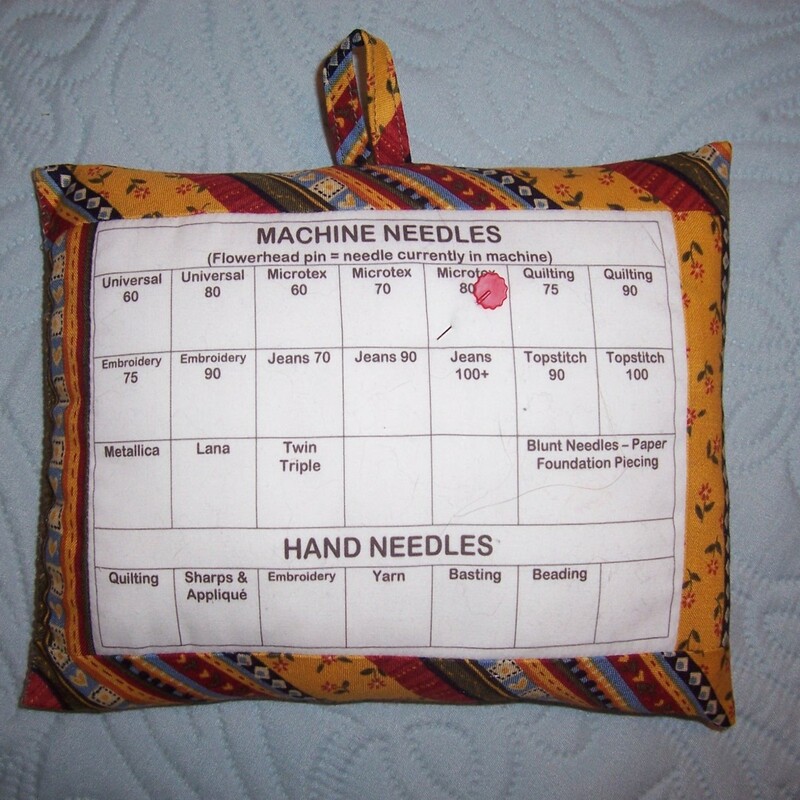 I set up my sewing machine in one of their units and using prepared fabric pieces was able to complete two bags. 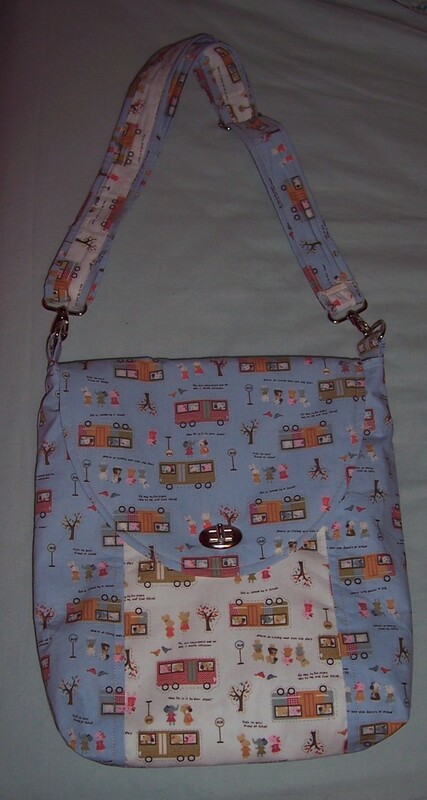 I used the same fabric combination for both bags, a charming print of school buses, bus stops, “little people” and trees in two colourways that I had bought on “sale” from Franklins in Salisbury. The same print is on either a Cream background or Blue background. 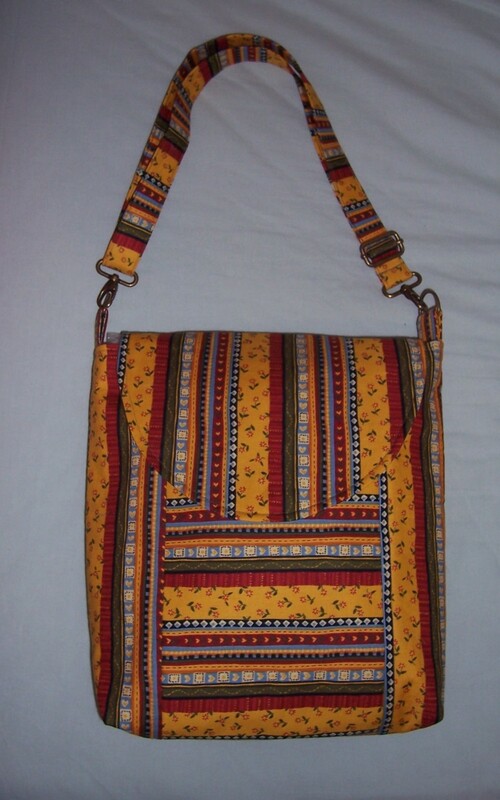 The first bag that I made was the Muti-purpose tech bag which is also ideal for use as a straightforward cross body bag but does not have quite so many pockets as the standard Cross Body Bag. I used a “silver” gromit and strap hardware of 2 nickel rectangles and a strap adjuster, plus a self-covered button fastening on the closure strap. Because of the print feel that this bag will appeal to the “younger” generation. 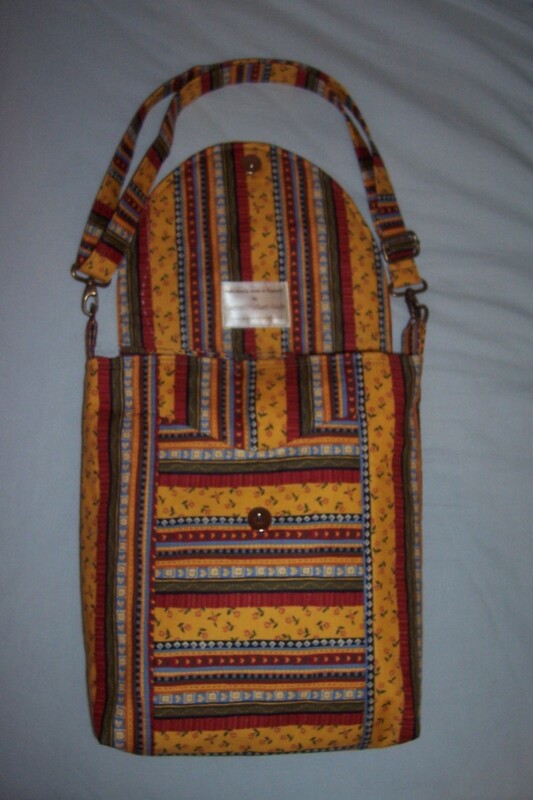 The second bag was that TNT Cross Body Bag. 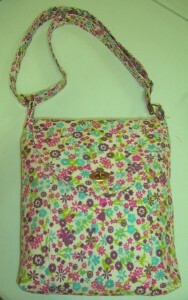 Again using the combination of printed cotton I included all the usual features. 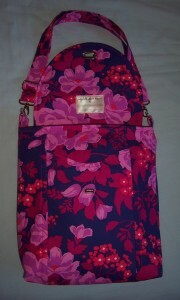 A two-tone strap with adjuster, Tabs with D rings, swivel hooks for the long strap and a twist lock. 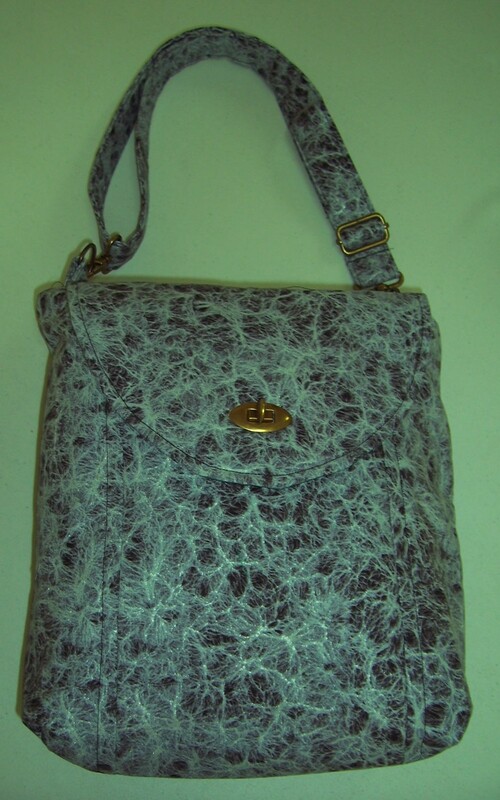 The lining is in the Cream background colourway to give a totally co-ordinated finish. Both bags are on demonstration at New Threads in anticipation of the two workshops planned for October and November. 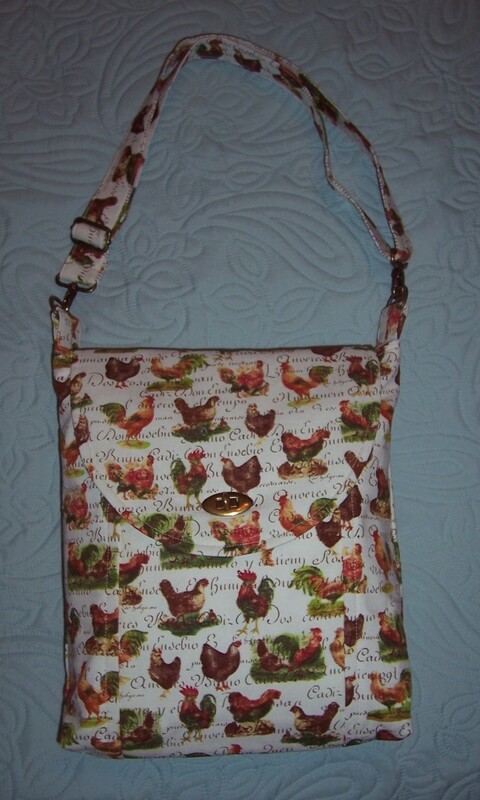 I had originally intended to make a chicken-themed bag for my sister, born in the year of the Rooster and anything related to Roosters and Chickens seemed appropriate. 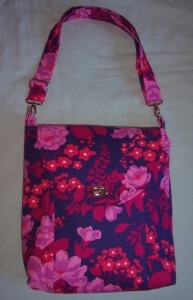 However, I was asked to make a bag in jewel colours eg. Sapphire, Ruby, Emerald – chickens would not cut it. I had already prepared the pieces of fabric which was bought from Fabricland, Salisbury and applied both fusible interfacing and fusible wadding where required. 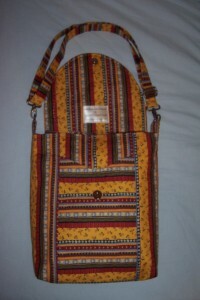 I then set the bag to one side to use as part demonstration for the CBB workshop held at Franklins. With one thing and another I did not quite get the bag finished in the classroom but this afternoon with an hour to spare managed to get the final details completed. 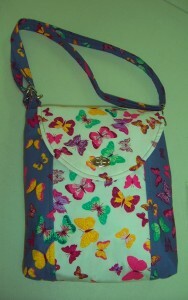 Here is the finished bag – all dressed up and nowhere to go! 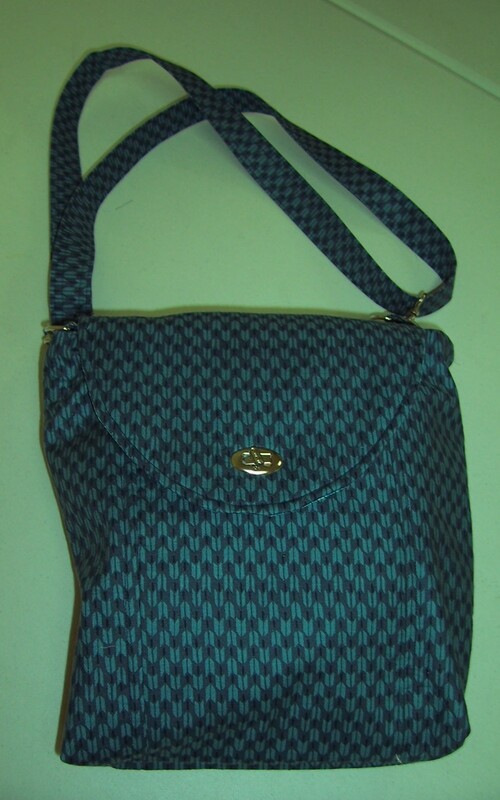 I will probably use it myself when wearing similar autumnal colours and it will also come in handy as yet another demonstration bag. 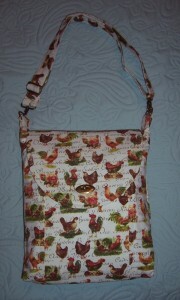 Cluck, cluck – now to make the jewel-coloured bag!! 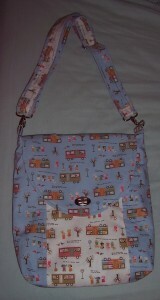 It has been a very exciting day as I hosted my first ever Cross Body Bag sewing workshop at Franklins, Salisbury. 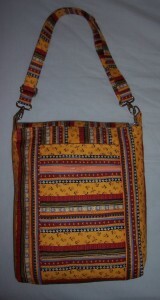 There were 6 ladies attending and by close of business we had six completed (or very nearly completed) new bags. I thoroughly enjoyed the day although I now have a sore throat and appear to have almost lost my voice but it was worth it! 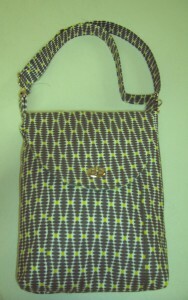 This bag design works well with a variety of fabrics, those made today were in 100% quilting cotton or linen blend. 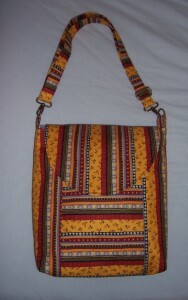 The bags that the ladies made were diverse and each one totally covetable as you can see from the photographs above and below. You may be thinking that this fabric is never-ending but I promise that I am now down to the last few scraps which I will use to make a scissor case and pin cushion. 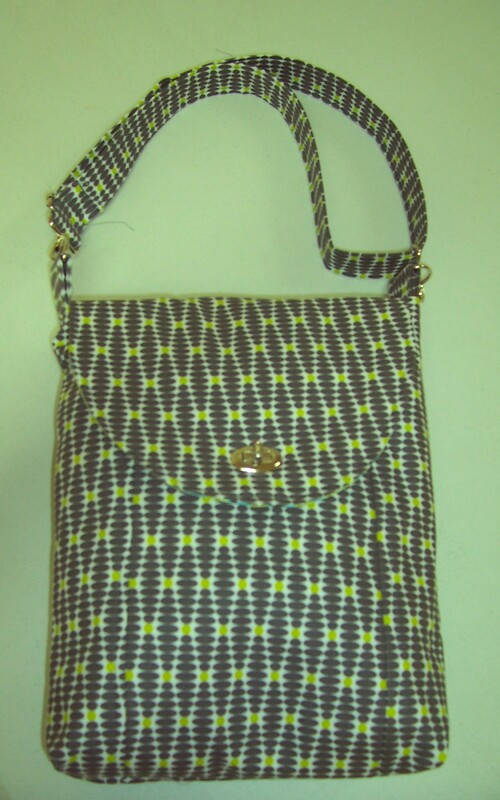 For this bag I used a magnetic snap fastener which does not “interfere” with the stripes of the printed cotton. I now have three sample bags which demonstrate different methods of closure:- tuck lock, twist lock and this magnetic snap. The remaining “hardware” on the bag has a brass finish, two D rings, two swivel clip hooks and a strap adjuster. 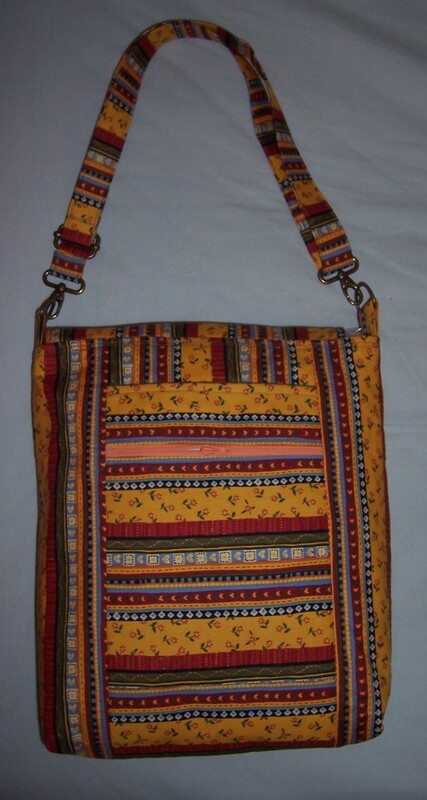 I used a bright Tangerine zip fastener on the reverse pocket and inside the linings are made from Cream curtain lining from my stash. The zip inside is a neutral beige. 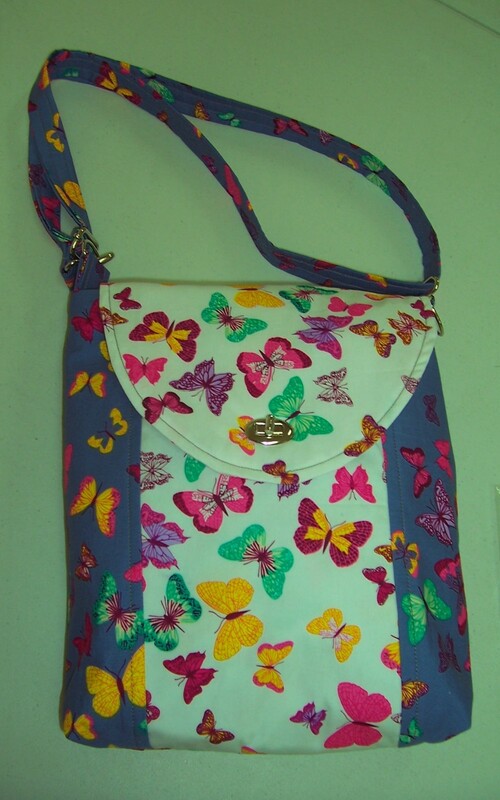 The colours and print of the outside of the bag are very BOLD so it won’t be easy to hide in a crowd or get mislaid! 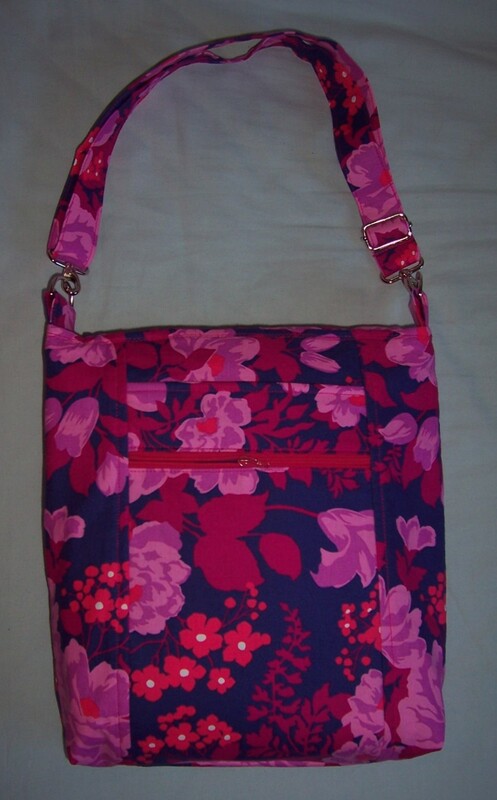 Next project on the list is to cut and part-make three bags as “Blue Peter” demonstration examples for the workshop……. I am getting all the bits and pieces ready in anticipation of the first Cross Body Bag workshop being held on Saturday 26th September at Franklins, Salisbury. 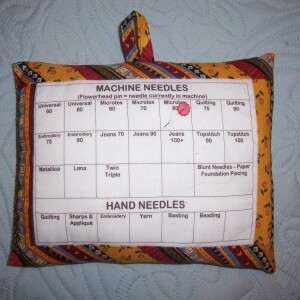 Using the scraps left over from making the Tunic Top (previous post) I have made myself a new needle organiser. The old one has been very well used over the past 5 years so a new one was definitely overdue. You will notice that by way of a change, I have cut the top and bottom strips on the bias which I think gives a nice effect. Next, I plan to make a new scissors case and pin cushion so that will use up every scrap of this lovely stripe print cotton and have all my accessories co-ordinated! As mentioned in the description of Loose fitting Tunic Top III and IV, I decided to re-visit this garment and make another for me. This time however I hacked the bodice from my TNT Prima dress pattern. 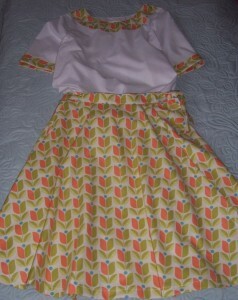 I extended the length to cover my hips and tummy but shaped the hemline in a similar way to my blouses. I find the gentle curve much more flattering than a boxy straight hem or even hem slits. Due to my generous bust I included the bust darts but omitted the body darts, instead I shaped the side seams using my dressmaker’s french curve ruler. I used a 2 ¼ “ bias strip to bind the neckline and thereafter all seams were overlocked and then faux flat felled using a khaki green thread. The sleeve caps have some gentle gathering into the armhole but the shoulder seam is still a little wide for my choice. The hems on the sleeves and the shaped hemline were overlocked, turned inside and then stitched with my favourite wide-spaced twin needle. Overall I am pleased with the result which I am wearing as I type. Next time I will reduce the width of the shoulders by a further ½ “ and maybe raise the neckline very slightly. Go Anywhere Wraparound Skirt – promotional garment size 10-12! Using fabric supplied by New Threads, Weyhill Fairground, I was asked to make a wraparound skirt to advertise an upcoming workshop. Having previously made a similar skirt in camouflage fabric for myself, I decided to draft the size 10-12 skirt and use that for this project. 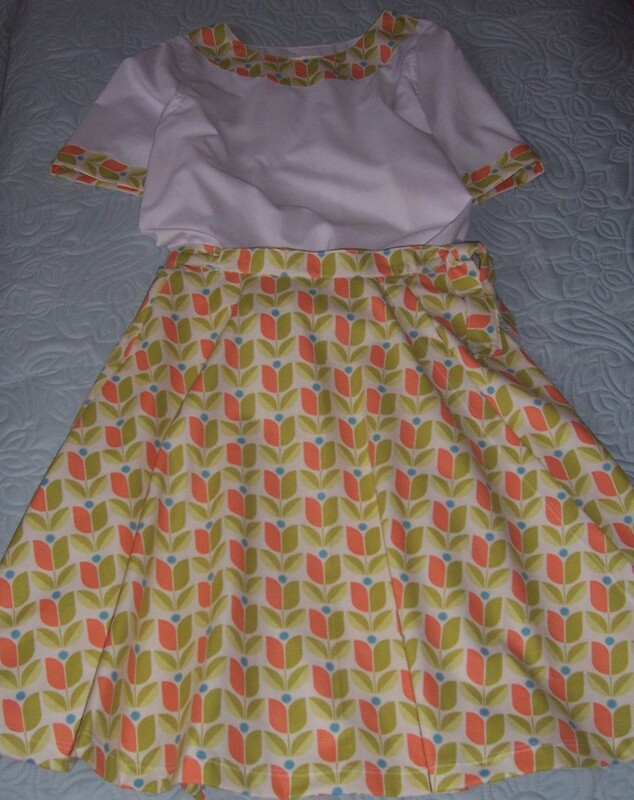 The fabric supplied was a charming printed cotton but I felt it needed a little something to add substance to the skirt so I underlined with a plain White polyester cotton from my stash. When cutting out I took care to match the pattern across the centre front and side seams. To ensure that there was sufficient underlap on the left front, I cut it full width I.e. Placed the centre front on the fold. I did the same for the right front piece with a reminder note to cut back some of the width later. I put the scraps of the printed fabric to one side and you can see in the next post how I used some of them to enhance a co-ordinating top. 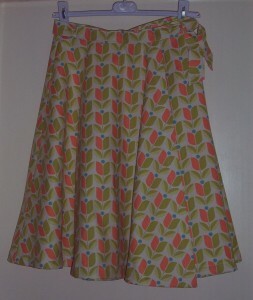 I pinned the underlining to each panel piece of the patterned cotton skirt fabric and overlocked the edges. Thereafter the construction was very simple. Sew the centre back seam, sew the side seams. Turn up and top stitch the hem and outer edges of the underlap and overlap with twin-needle. Attach the waistband/tie belt. Top stitch. Make a large buttonhole for threading through the tie belt. Press and admire! 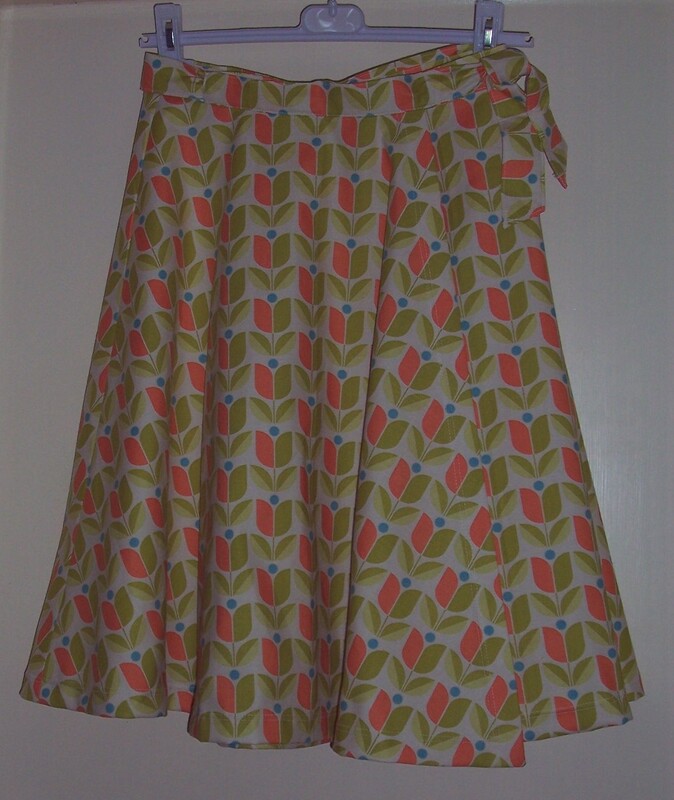 I am pleased with the final result although I still think there is room for some adjustment to the width of the overlap but meantime I have a finished skirt which I think will demonstrate the workshop project well and hopefully encourage people to sign up. The previous posting describes the demonstration wraparound skirt that I was asked to make to advertise an upcoming workshop at New Threads, Weyhill Fairground. I cut out the skirt and realised that I could utilise the scraps to enhance a plain top that would be fitted onto the dressmaker’s dummy when displaying the skirt. I cut out the top to a size 12 using some plain White polyester Cotton and in just over 2 hours had completed the tunic top. I made reverse facings using the scraps of printed cotton and also added bands to the hems of the sleeves. All construction seams were overlocked and then faux flat felled into place. This gave a really neat finish to the insides of the top. I allowed 5” slits to the side seams and then topstitched the hem using my widest-set twin-needle. The hems on the sleeves are hand slip-stitched inside as I did not want to sew over the printed design. Now that the demonstration garments are completed and bearing in mind the dissatisfaction with the recent tunic top that I made for me, I plan to re-visit my TNT Go Anywhere Dress pattern. I want to draft a tunic top which will be a little more fitted and also have set-in sleeves with narrower shoulder seams. Watch this space….. 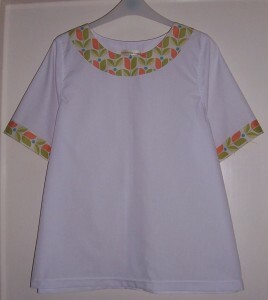 I knew that this tunic top was a “fast and easy” make, on Sunday morning I set to and did a lot of cutting out. 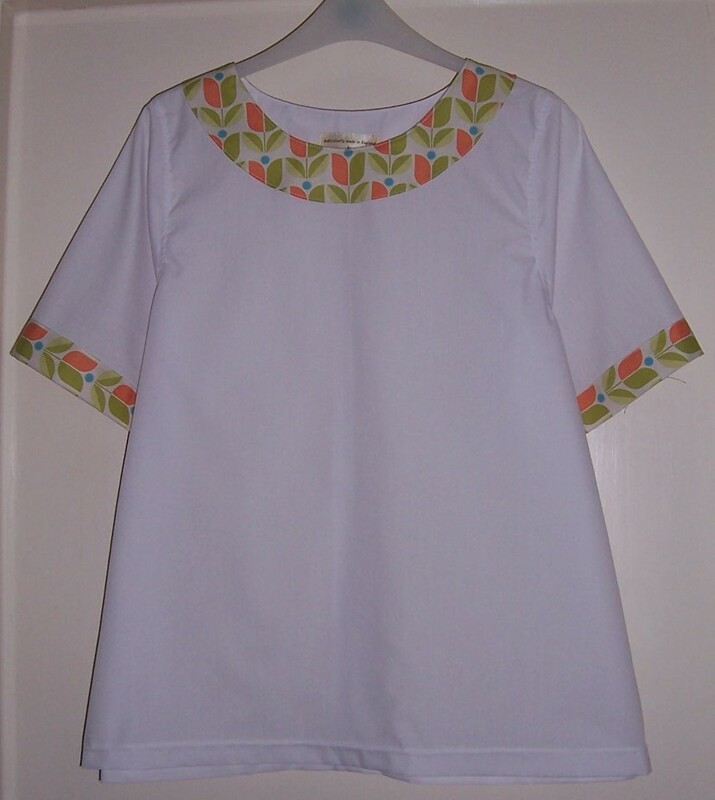 In addition to a size 12 wraparound skirt and co-ordinating size 12 tunic top – both for Elsie the dressmaker’s dummy at New Threads, I also cut out a larger version of the tunic top for me. 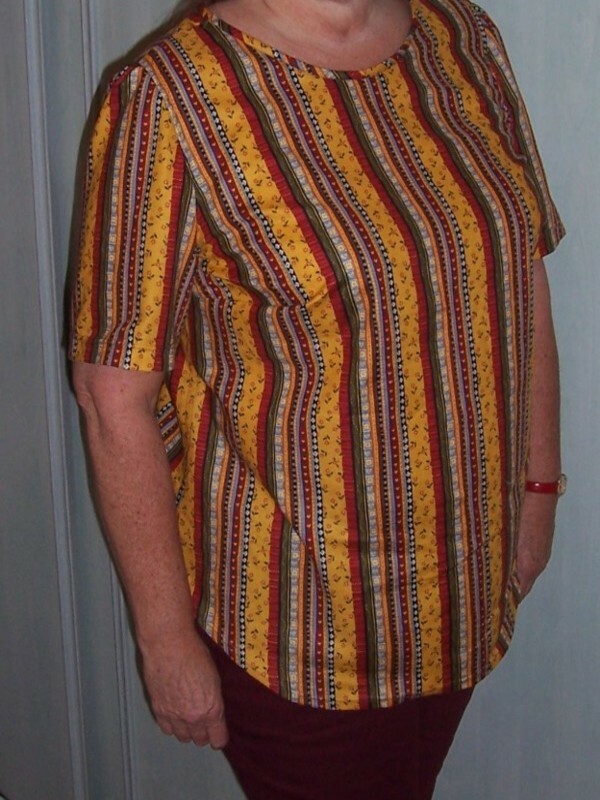 I used a colourful printed stripe cotton bought “on sale” from Franklins in Salisbury. The sewing machine and overlocker were both still threaded up with khaki green thread which would work well with the colours of the print so I simply “went for it!” In just 2 hours I had completed the top. It has a self bias binding around the gentle scoop neckline, flat fell seams on the shoulders, overlocked and faux flat fell seams elsewhere plus twin-needle stitched hems on the sleeves and bodice. I had previously made this tunic top for me using a nautical print cotton and that had turned out fine. This time – I don’t know – it just does not seem quite right. Is it the generous fit? I have lost some weight is that what is making the difference? Is it the length and width of the sleeves? Is it simply the design of the print? 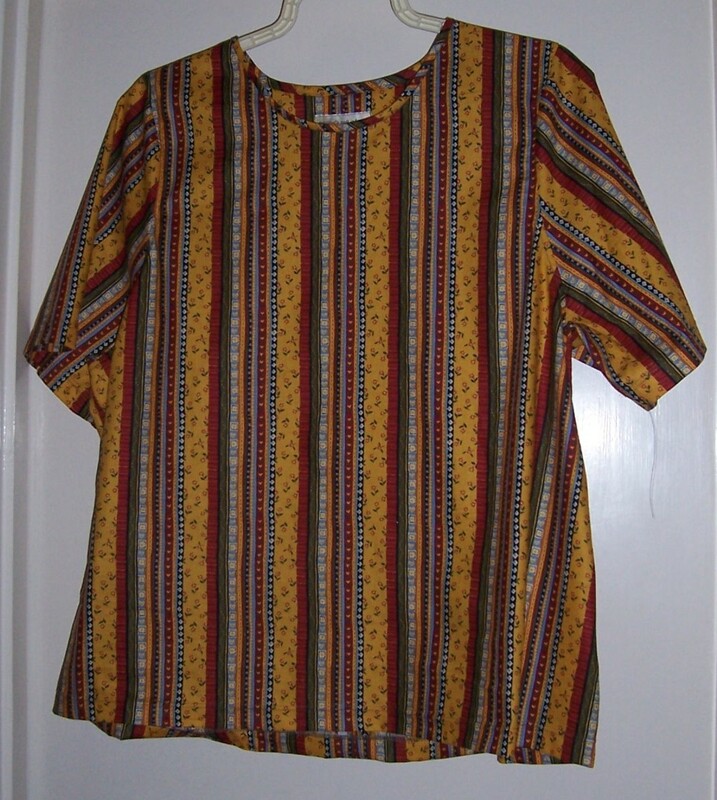 Regardless, I shall offer for sale on eBay and hope that the tunic top finds a new home where it will be loved. Meantime, I still have a good length of fabric left so will see if there is sufficient to make a more fitted top from a.n.other TNT pattern. Back to the drawing board…..